The upper and lower limbs (including the shoulder girdle and pelvic girdle) begin development in the 4th week of gestation. Usually the upper limb begins development first, with the lower limb often lagging 2-3 days behind. The limbs are well differentiated by week 8. In this article we shall cover the basic embryological development of the limbs, as well as some important clinical conditions. Fig 1.1 Development of the limb bud showing the apical ectodermal ridge and underlying tissues. The limb buds are the precursor structures of the limbs. Their formation begins in the 4th week, with the activation of mesenchymal cells in the somatic layer of lateral plate mesoderm. The limb buds first appear on the ventrolateral body wall initially and extend ventrally. They consist of a central core of undifferentiated mesenchyme tipped with a layer of ectoderm, the apical ectodermal ridge (AER). Elongation occurs through proliferation of the underlying mesenchyme core, in which the AER plays a crucial role in ensuring that the mesenchyme immediately underneath it remains undifferentiated. As growth proceeds, the proximal mesenchyme loses signals from the AER and begins to differentiate into the constituent tissues of the limbs. 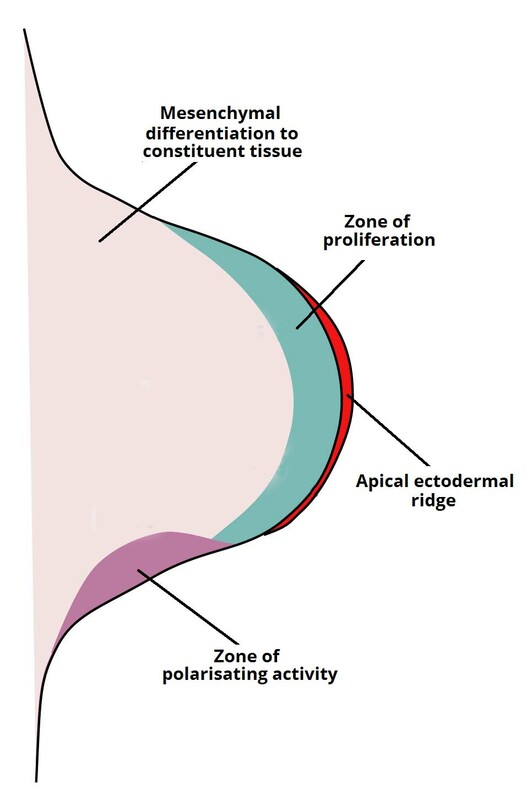 The AER itself is maintained by the Zone of Polarising Activity (ZPA) which is found in the posterior base of the limb bud. The ZPA’s secondary responsibility is to ensure asymmetry in the limbs. The position of the AER is important as it marks the boundary between the dorsal and ventral limb ectoderm – the ectoderm is able to exert ‘dorsalising and ventralising’ influences over the mesenchyme core. For example, it removes hair follicles from the palms and soles of the feet. 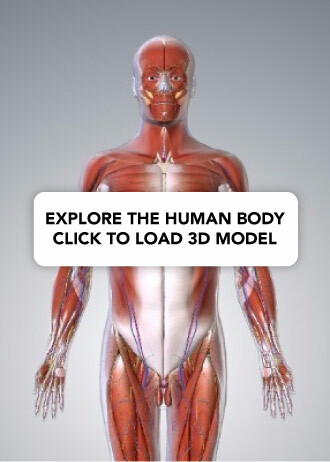 As elongation continues, the mesenchyme condenses into plates forming the cartilaginous models of the future digital bones. The AER then breaks up and is maintained only over the tips of the future digits. The interdigital spaces are then progressively sculpted by cellular apoptosis. Congenital limb and digit defects occur in between 1 in 500 and 1 in 1000 live births. They are often associated with other birth defects, such as congenital heart malformations. Amelia – complete absence of a limb. Meromelia – partial absence of one or more limb structures. Syndactyly – fusion of digits, which occurs due to a lack of apoptosis between the digits during development. Polydactyly – increased number of digits. 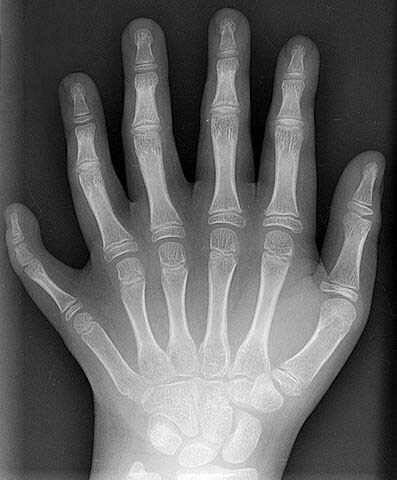 Fig 2 An example of polydactyly on x-ray. This patient had a duplication of their middle finger. Limb bud development begins in which week? The digits are sculpted by what process?